Treasure Island Pavilion...located on quiet Sunset Beach, is popular for beach weddings. The locals refer to it as Sunset Beach Pavilion, so there has been some confusion for brides wanting to plan their special Florida beach wedding. It is all the same place...the names are just used interchangably...sometimes in the same sentence. Brides really don't need this anxiety. Even though I have been past here many times, it wasn't until today that I made it a point to stop and spend some time. Since it was the middle of May, I didn't expect to find the parking lot filled to capacity like during Spring Break (March - April) or the summer months of June and July, and I was right. There were only a couple of cars in the parking lot, and the beach was almost deserted . A group of four retirees were sharing a brunch under the roof (it was about 10:00am), while across boardwalk a couple of bright beach umbrellas had people dozing under them. This is the southern-most public beach access on Treasure Island . It is a beautiful structure with covered picnic tables, a spacious area, and very nice restrooms. The entrance is kind of tricky...you have to go all the way down to the south end of Tern Parking Lot to get in. The EXIT is at the north end, as the lot is ONE WAY. 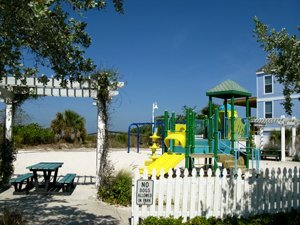 There is an outstanding playground for children, with two shaded picnic tables where parents can watch without getting totally roasted. The equipment is colorful, modern, and inviting for youngsters. It is not a huge area for running, but the beach is just over the sand dune if kids get too energetic. I was impressed with the cleanliness of the entire area and the wheelchair access to the Treasure Island Pavilion. I also noticed a young couple under the roof with a laptop...and in talking with them, I found out there is free WIFI available . Who wudda thunk it? What a pleasant outside setting to catch up on emails. 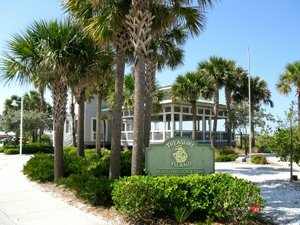 If you go to the Treasure Island FL city page, you'll find important information on rates for renting this beautiful structure . As of this writing, the Non-Resident cost is $300.00 (plus tax) for a six-hour rental, during operational hours 12 noon to sunset. More and more, this is becoming a popular spot for weddings. And why not? It is a beautiful setting. Note: There is NO electricity, so make sure the bride is aware of this and plans accordingly. The occupancy level is 100 and no glass containers are allowed on the beach. What makes this nice for weddings is that the parking lot can actually be rented for a three hour time limit. More than enough for a romantic beach wedding.